Men of Boston: Back away from the Celtics jersey! It's time to step up your game and suit up! Indochino, the leader in custom online menswear, is opening a brick and mortar pop-up shop at 234 Clarendon St. in Back Bay from March 22 through April 15, and they're giving one Well-Appointed Catwalk reader a custom Essential Collection two-piece suit to celebrate. Leave one comment below telling me you've done so. For an extra entry, you may share news of the giveaway on Facebook or Twitter and leave one additional comment below. Entries will be accepted through the end of the day on Friday, March 22, at which point I will randomly choose a winner to be announced the following day. 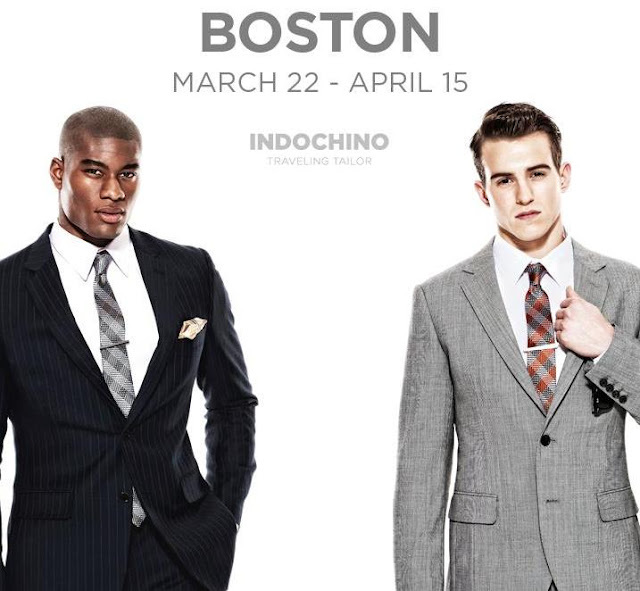 Regardless of who wins, Bostonians should sign up for an appointment with Indochino's traveling tailor here. Prices are remarkably reasonable for a quality custom suit, and registering for an appointment in advance entitles you to a complimentary dress shirt and gift set with any suit purchase. Fun! Josh could use a new suit for an upcoming wedding :). I'm following you & Indochino on twitter. Already following all of the above on facebook and twitter! looking forward to checking out the pop-up! Hi Marissa! Followed both on Twitter! RTed the giveaway as well! hi, i followed The Well-Appointed Catwalk and Indochino on fb + twitter. thanks for the giveaway! I'm following both on Facebook! I follow both of you on Twitter and Craig needs this so bad for our wedding I can't even explain to you how necessary this is. This is the greatest giveaway! I just entered and am following you both on Twitter! Eric would LOVE this! I'll help you promote! Awesome! What a fabulous giveaway! Following on twitter (@kziegs). I have twittered you both! Following both on Twitter. Thanks! I follow you both now via @ErikaMcMahon_! What a fantastic giveaway. Andrew would be adorable in an Indochino custom suit! You know I follow you (everywhere you go) and now I'm following Indochino on twitter. I wish they made custom suits for women! I am the most current follower of both on Twitter! omg, my bf would be so happy about this! obvi i follow you, b/c i love you. but now follow indochino too. also would be a great excuse to come to beantown to see the fabrics in real life. Wow. This would be amazing. My husband has always wanted a custom suit. I followed both of you! Thanks, lady! Following both and my husband would relish this opportunity! Love the idea of getting a custom suit. Husband's suits' have back pocket holes! I followed both on Facebook and twitter! I "liked" both on Facebook! I've liked both on Facebook! What a great giveaway! Liked them both on facebook!! Following both of you on Facebook - Kasia G.
Following both on twitter ( @kjachou ) ! Following and liked both. Greg will have to check out the pop-up! Following and liked both! -Diana R.
I also tweeted about the contest and shared it on my FB wall. end of the day on Friday, March 19? Following both. I liked both pages on Facebook as D. Wallace. I would love to win this prize for my beau! I follow both on twitter, @slowclublover. I follow you on Twitter and am a FB fan already :-) I followed/fanned Indochino. Weeee! Official entry on behalf of the Mr- who refuses to have his own twitter or FB account. I follow you everywhere, of course, and just liked Indochino on the FB. wow how great! My husband would love it!